I’m not a vegetarian. But when I eat animal products, I make sure they’re of the organic, grass-fed variety or fresh (never eat farm raised salmon, but that’s a post for another day). Let’s just say I don’t eat meat often, but I’ve been toying with the idea of trying to incorporate it in my diet a bit more. I also don’t consume dairy 99% of the time and eat clean whenever possible. Needless to say I am intrigued by the Paleo lifestyle and figured I’d brush up on it and give you guys a little lesson in the process! I like the whole foods based approach and the focus on eating organic. I also like the incorporation of healthy fats and avoiding processed foods and sugars. The low glycemic nature of this way of eating is great for stabilizing blood sugar – say bye to cravings and binges! What else? The diet is low-carb, the primary source of which is mainly veggies. With the Paleo Diet, it’s also important to listen to your body for hunger cues, and only to eat when you’re truly hungry. I love how Paleo promotes exercise too! Staying active is key for overall health. There’s more to it, but that’s it in a nutshell. Every now and then I want chocolate. Okay fine, I want chocolate ALL THE TIME. This can be a bit of a problem so I try to incorporate a moderate amount of chocolate into my life (sometimes daily) with healthy recipes. I came across this one and added to my “to make” list: “The Best Coconut Flour Chocolate Chunk Bars” from Ambitious Kitchen – click here for full recipe. I quickly realized I had all the ingredients on hand, however, and got to baking immediately. 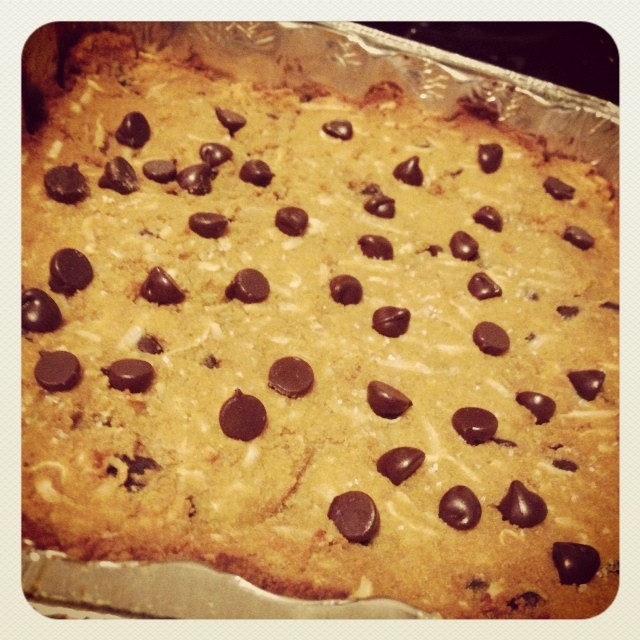 Did I mention these bars are Paleo and gluten-free? I used agave – while I love honey, and maple syrup is okay, I think agave has the best taste in baked goods; maybe that’s just me. I got crazy and used pink salt in the recipe, but I sprinkled a couple of pinches of sea salt on top before baking – I highly recommend doing this, especially if you’re a salty/sweet freak like me. Definitely add those unsweetened coconut flakes! I basically devoured the whole pan by myself in the course of three days! Also to note: the boyfriend vehemently dislikes coconut and most of my “healthy” cooking, but thought these bars were, “actually really good!” He had no idea these scrumptious bars were laden with coconut…oil, flour & flakes! I’m so sneaky, what can I say?